Photographer Norbert Rosing captured these images of a 1,200 lb. 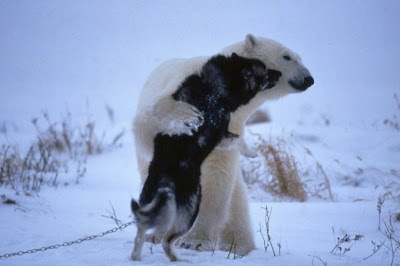 polar bear playing with husky sled dogs in Canada's Hudson Bay. More photos here. 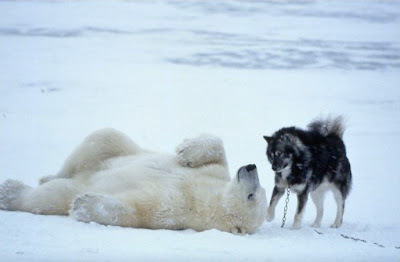 Hi there Interspecies Friends and folks! I just wanted to let you know that I love this extremely nice stuff. However, there is always a big deal which I have to deal with every time I surf the NET. The matter is that I am always tempted to get some Generic Viagra . Anyway, I didn't mean to miss the point. You have done such a masterpiece of this wonderful site due to your hardworking attitude. 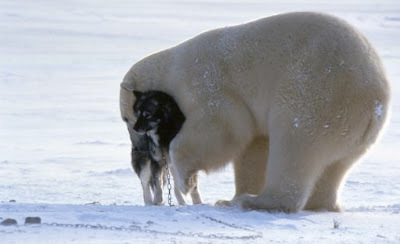 By the way, Polar Bears Rule! "Friendship at the water's edge"
"Paternal dog Billy takes on an unusual kid"
BBC News: "Rare deer twin in the dog house"